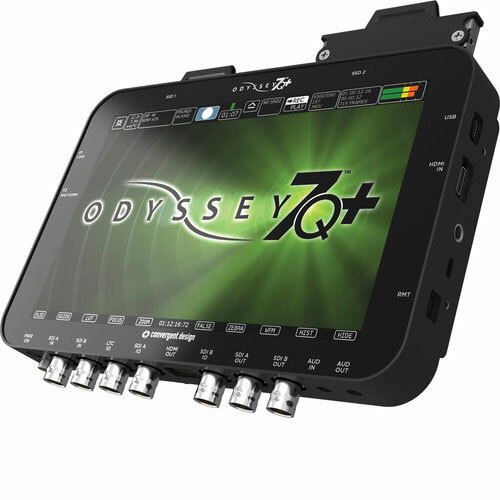 The Odyssey7Q+ is the most advanced, most capable, most versatile monitor/recorder in the world, monitor/recorder that provides all of the features and functionality of the Odyssey7Q but adds support for 4K recording over HDMI. It features a 7.7″, 1280 x 800, OLED, touchscreen display with a 3400:1 contrast ratio, true blacks, and advanced image analysis tools, including waveform, histogram, false color, and built-in display LUTs. Out-of-the-box, the Odyssey7Q+ can record up to 4K/UHD in the compressed Apple ProRes 422 HQ format or up to 2K/1080p using the uncompressed DPX file format. Additionally, it supports several RAW recording options for ARRI, Canon, Sony, and POV cameras. Convergent Design Odyssey 7Q+ OLED Monitor & Recorder available for rent or hire from RENTaCAM Sydney. power supply, monitor arm, hood, all cables, case.